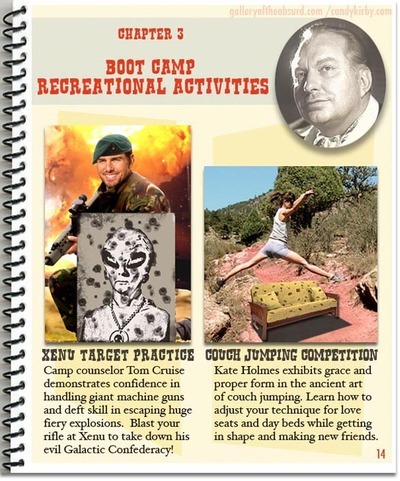 Star magazine claims Scientology Boot Camp consists of "grueling lie detector tests, 36-hour auditing sessions, and constant surveillance", but the magazine never mentioned the entertaining recreational activities participants enjoy during their stay. 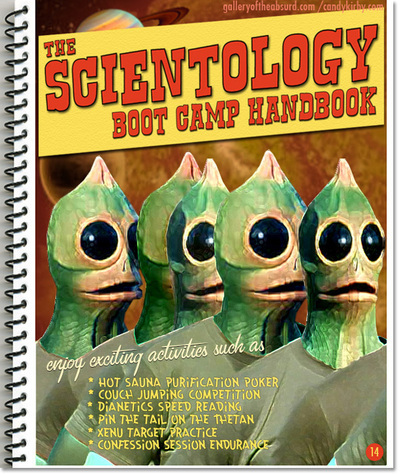 Despite the barbed wire fences and forced interrogation, Scientology boot camp can be barrels of fun. For more recreational activities, such as Wig-Making with John Travolta, take a look here. Okay, now I'm jealous. 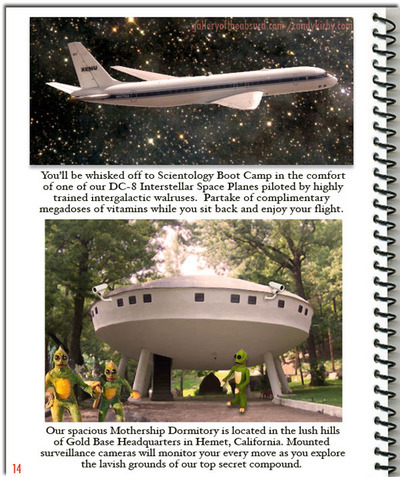 Scientology Boot Camp victims participants get to fly in vintage DC-8 Interstellar Space Planes! Not only that, they'll sleep in a realistic-looking Mothership Dormitory. Hold me back, I'm this close to signing up! 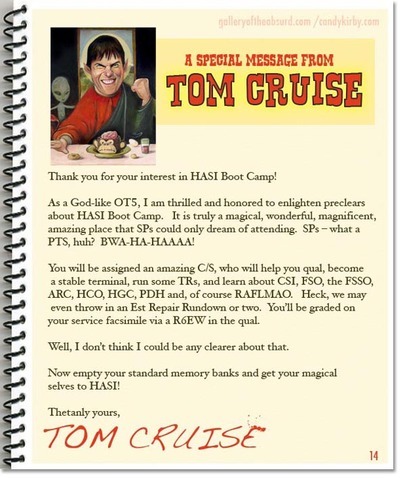 Each handbook features a special introductory letter from Tom Cruise welcoming PCs to clear their engrams and avoid SP influence during RPF telepathic regeneration ORC assignments. Medium: Digital collage. 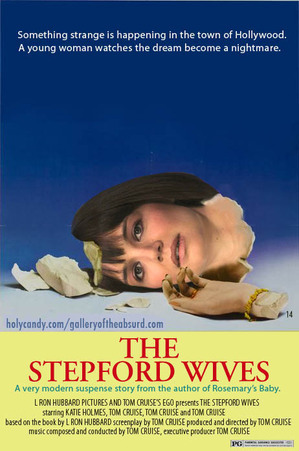 Created in collaboration with Candy Kirby. Letter from Tom Cruise written by Candy. 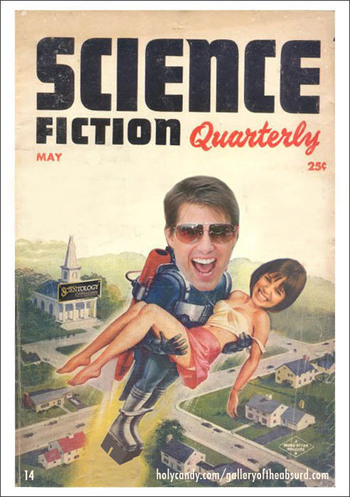 Hurry, hurry, step right up and see the Tom Cruise, Scientologist, pictured in his natural environment on the distant planet Xorzax. Prepare to be amazed as the L. Ron Hubbard spaceship beams top-secret information from the Galactic Confederacy directly into Tom’s cerebral cortex and then marvel as Tom jumps around and cackles as he incoherently spews Hubbard’s thought rays out his mouth and into the collective consciousness of any Earthling that will listen. Many Earthlings simply ignore or find fleeting entertainment in the wild gesticulations and deranged rants this tiny alien species displays, but make no mistake, this seemingly harmless little extraterrestrial packs a mean punch if you dare to tease, criticize or suggest psychiatric treatment to him. Best to view him from afar. Medium: oil on wood, photoshop. 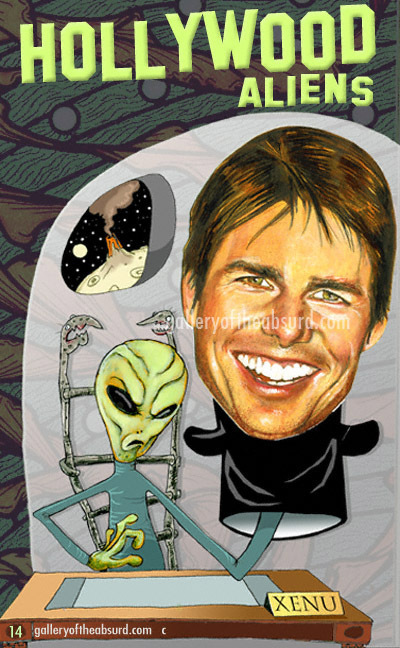 According to a report in the UK Sun, some Scientology leaders believe Tom Cruise is the "Christ of Scientology". Flabbergasted after reading such a claim, we decided to send a group of undercover agents to investigate the dark recesses of the Los Angeles Church of Scientology in order to seek clues. Extraordinary claims require extraordinary evidence and we obtained it! Our wily agents gained entrance into the fortress by feigning interest in being "audited" and were quickly able to escape unnoticed into the darkness of the church basement. 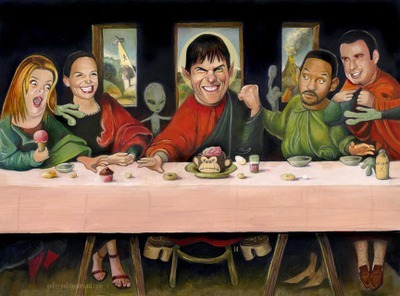 Prying open the safe, our agents were shocked to discover Leopold Da Vinnie's famous painting, "The Scientologist's Last Supper". 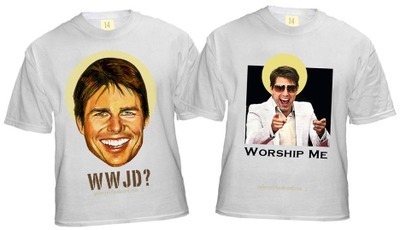 It clearly shows Tom Cruise as Christ, but leaves several other questions unanswered. For instance, who is the mysterious woman seated to His left and why is she smiling like that? Could she be his...gasp...wife? Is that a Jenny Craig-approved cupcake Kirstie Alley is grabbing? John Travolta is wearing loafers and he's floating - what does this mean? How did Will Smith get mixed up with this bunch? So many questions, so few answers. Medium: Acrylic on board, unfinished. Thanks Holly for the brainstorm. While snooping through the safe, our investigators also obtained this photo of what appears to be an image of Christ burned into a piece of toast. It's a miracle! 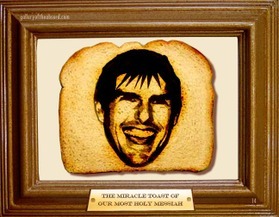 Based on our dangerous, yet thorough investigation, we conclude that Tom Cruise is indeed the Scientology Christ. Just take a look at these t-shirts we found in the basement. Nothing says LOVE like signing a $5 million contract agreement to pose as a loving companion to a tiny man with a very large ego. This nasty little rumor was reported on Page Six and in the New York Daily News, but of course we know it can't be true. 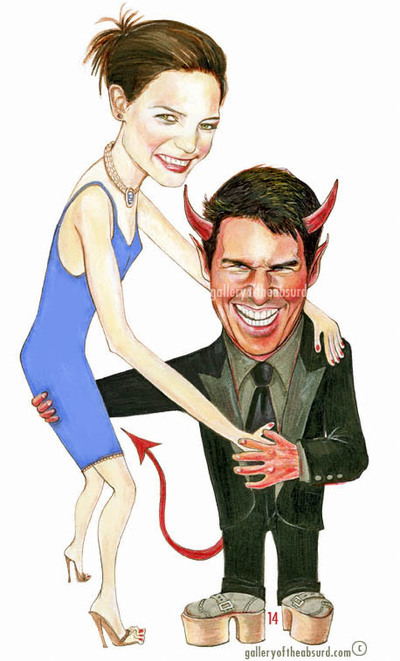 Obviously Tom Cruise and Katie Holmes are madly in love and shove show their affection and devotion to each other every time they make a public appearance. When I think of LOVE, the first romantic vision that flutters into my head is Tom and Katie with their gushing big grins and persistant public declarations of love. Sigh. Medium: Ink, acrylic on paper, digital hoo ha.